El Nido's parked up right next to the River Swale, with the sliding door open and a great view of the flowing river and the hills beyond. We're still on the Usha Gap campsite, but have moved from the big field to this much smaller grass area on the other side of the road and right next to the river. I think this was probably the origins of the campsite, just a few pitches as a way to earn some extra income. But no doubt the popularity of the spot, plus a lack of other campsites nearby, led to the growth. It was certainly busy for the first two nights, but this morning nearly everyone had left, so we had the big field to ourselves, hence the move for our last night here to experience the 'cool camping' this site is known for. We're also now very close to the facilities and with so few people camping, will make the most of the hot showers and washing up sinks. The rain woke us at about 0630 this morning; Cathy had a read while I snoozed on for a while. I made us a brew and we sat looking out at the campers packing up in the drizzle. After breakfast we went for a bit of stomp, first checking there was space for us to move to the river pitches. We walked along the road toward Muker, then turned off to cross the river on a small bridge and climb steeply up the hillside. The path was hard to spot and we had to cross streams a couple of times, as well as stop for the odd breather, but the views north over Kisdon Hill and the campsite were outstanding. We eventually made it to the top and followed a track downhill to Muker. I couple of times I was chatting to Cathy (or so I thought! ), only to realise I was talking to myself; she'd found some wild raspberries and was busily and happily stuffing her face! At least it's a superfood and gave her the energy to walk back to the campsite. 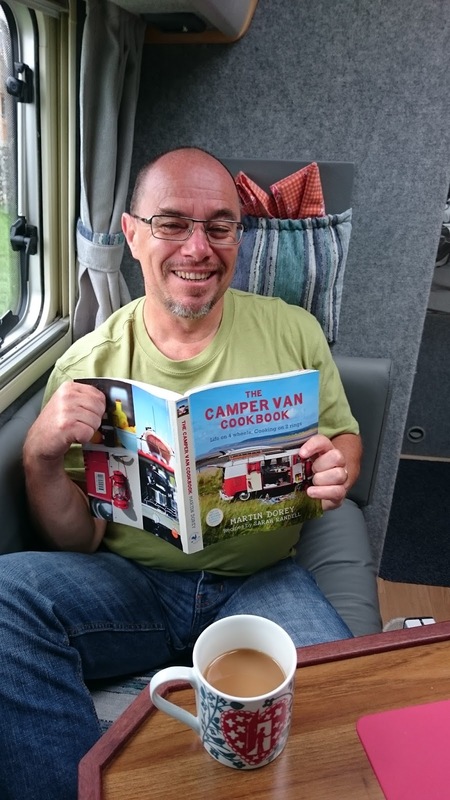 Having moved the van we sat with a brew listening to the river (sliding door shut but galley door open due to the rain). 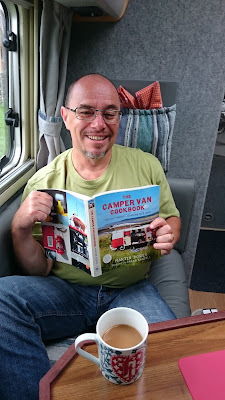 Cathy went off for a walk along the river and I stayed in to flick through my Camper Van Cookbook and just stare out at the great view as the clouds slowly moved across the hills. The only downside is that I'd planned to go for a bike ride today. 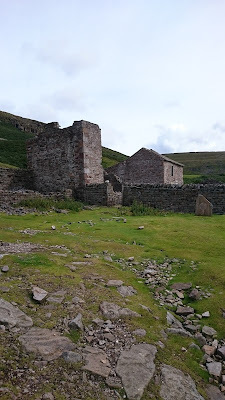 I was aiming to take the road up to Keld, with some long, steady climbs and downhills, but this wouldn't have been much fun even with spitting rain; although that wouldn't bother me too much, there's nowhere in the van to dry or store wet cycling gear. So I'll have to save the cycling for another day (I can hear my cycling Wingman - Ray - calling me a "Tart"!). It rained on and off all day; at the moment the rain on the roof is louder than the y river. Cathy had a snooze while I practised some Uke chords, before cooking dinner - a sort of sweet and sour chicken with rice. Cathy washed up over the road while I tidied away and swatted away the tiny midges who were now making a bee-line for any unprotected skin. A large Mercedes selfie turned up, looks like a great van, plus a young chap in a small Romahome with a pop-up roof was parked behind us, with his collie for company. Now, as the light fades and the rain gently falls, we're cozy inside, reading and thinking about whether to have some pudding with a cup of tea! 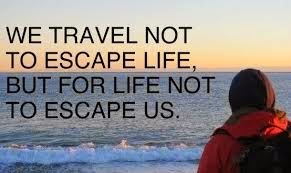 Tomorrow we move on, hopefully to a Britstop close by. We need to ring in advance to check, but first we'll need a phone signal! We were in bed by 2100 last night and didn't wake up until 0920 this morning! We breakfasted outside, then made a packed lunch and flask, packed our rucksacks and walked back towards Muker. 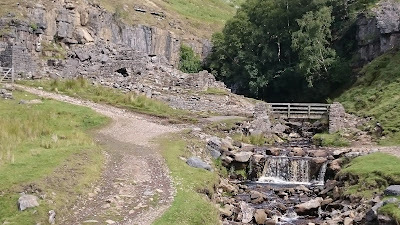 We again passed thorough the meadows for the start of a 6 mile circular walk to Keld, crossing the river Swale via Rampsholme bridge, this time turning left and following the river along a wild stone track. We stopped at the waterfalls at Swinner Gill, with the old lead mining ruins, for Cathy to have a quick paddle and cool off; it would be a great spot for a wild swim. We carried on up the track, climbing all the time. 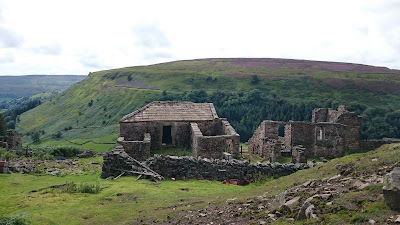 I saw that Crackpot Hall was just off the route, so we detoured off to take a look. The remains of the Halł had a fantastic view down the valley towards Muker. 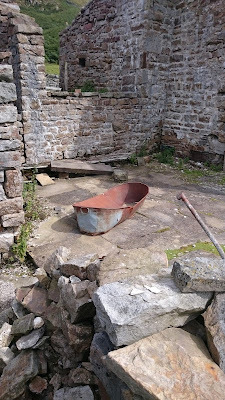 There were still remains of the iron range in the kitchen and even the skeleton of the old tin bath! Apparently the daughter was known as a real wild child, not surprising looking at the surroundings. It must have been a lovely home in its time, but now sadly falling into ruin. We stopped on the hill above the Hall for a lunch with a view, before carrying on until we reached the junction of the Pennine Way, dropping down to the river and another large and beautiful waterfall. Crossing the river again, we climbed up to the small hamlet of Keld, where Cathy treated me to an ice cream. Walking out we found Ruskin's campsite, a lovely small and quiet basic site - one to remember for the future. Heading out we turned left near the hotel/pub and shortly turned off to walk up the corpse road. In the past the dead in wicker coffins were carried along this route, over the hills, to the church at Grinton, near Reeth - it took them two days! Imagine being sat in the pub and someone comes in to tell you 'old Fred' has died - time to sup up and get your walking boots on! The corpse road took us on a long steady climb up Kisdon Hill, where we stopped at the top overlooking Muker for a brew and flapjack. After a jelly-leg descent, we were back in the village and a short walk to the campsite. Rucksacks unpacked, hot water heater on, boots off and a cold beer in hand, it was time to chill out before showers and walking back the Farmer's Arms for tonight's dinner. The pub was very busy and it looked unlikely we'd find a table, but as we walked in and I ordered our drinks, a group left so Cathy piled in! Food ordered, we had a flick through the local magazine - lots going on in this close-knit community. We were asked if we'd mind sharing our table with a group of four - fine by us - two couples staying on the same campsite. Our food took a while but it was cooked to order, piping hot and very tasty. Cathy had steak pie, chips and veg, me pork casserole, rice and veg. The Farmer's bitter went very well with the food! Meals eaten we walked back to the campsite and retired to the van, Cathy reading and me plucking at the Uke. Another early night, but we're happy to crash out with a full belly and a good book. Not sure Cathy knows yet we have to clamber up those rocks! At least she freed me later! 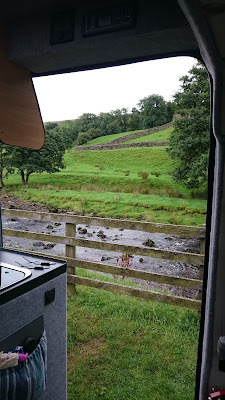 El Nido is parked up in the Usha Gap campsite, just outside the small village of Muker, in Swaledale, Yorkshire. This is a very popular site, with a small camping area by the river, then two larger fields. We're in the second field with long meadow grass but, as the lady owner said, no sheep poo in this one! We're pitched with our back to a dry stone wall, facing the setting sun, sat outside with a drink before thinking about what to have for dinner. Since we arrived it's filled up with many more tents mainly; families and a few larger groups of friends, all out to have a good time. It's about 15'C, a bit blowy but warm in the sunshine. It's a very peaceful spot to just chill. We had a lazy start this morning, waking up just before 0800. This seems to be our natural waking time, which will be fine when we no longer have to work and we're long-term travelling. Breakfast done, van loaded up and the bike on the rack, we drove out and up the M6, coming off early enough to enjoy a lovely drive through Lancashire (past where we stopped in Worston) and into Yorkshire. There were signs for the Tour of Britain road closure in a week's time - shame we'll miss it. We arrived at Usha Gap at about 1230, parked up, fridge to gas and put the kettle on. A quick sandwich lunch and we headed out for a walk. We followed the road into Muker, then the footpath through the meadows to the bridge over the river Swale. We took a higher path onto a tarmac road, looking down on the river and the meadows with their stone barns. Eventually we dropped back down to the river for our return. On the other bank we spotted an adult otter, which ran over the stones and gracefully entered the water, swimming upstream and no doubt hunting for supper. The path took us back to the bridge and into Muker. We stopped off at the Farmer's Arms to quench our thirst with a quick pint of Farmer's Bitter, then popped in the shop for some bread before following the road back to the campsite. On our way we saw loads of polka-dot barn doors, even sides of houses, plus yellow bikes on walls, a legacy of last year's brilliantly successful first few days of the Tour de France. 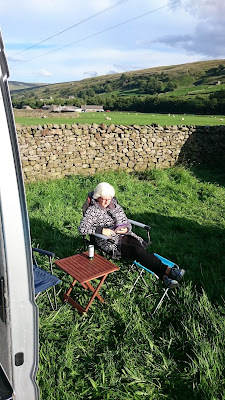 Stage 1, which Ray and I watched from the roadside, came through Muker and directly passed the campsite. We sat outside the van reading and enjoying the sunshine, before I prepared dinner - a one pot of chicken, vegetables and potato. By the time it was cooked it was chilly out, so Cathy packed up and we ate inside. Washed up, we sat with a mug of hot chocolate, watching the sunset and other campers cooking their meals on BBQs. It was quite buzzy outside, with everyone enjoying being outside, lots of smoky BBQs on the go. Although we haven't used them yet, the facilities are very good here. Warm and clean toilets, free showers and washing up facilities. We have a couple of days to enjoy the walks and cycling. So time for an early night, reading and chilling in the van.